When the value of an independent variable (usually x) makes the values of two or more functions equal, it is part of the solution to the system of equations. 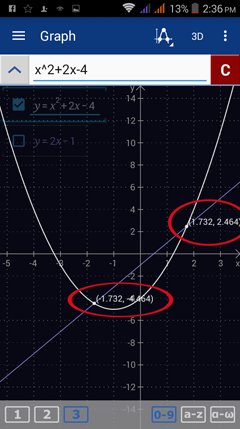 Graphically, these values are the coordinates of the points where the functions intersect. 1) Enter each equation in the input field. The graphs are simultaneously displayed on the screen. 2) Tap the special points icon and check Show intersections. 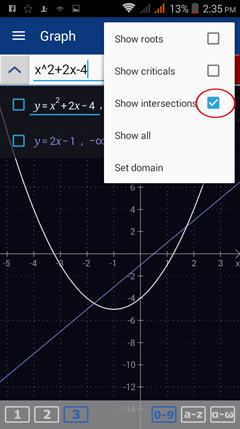 3) Check the box (on the left of the function) of one of the functions entered to display points of intersection.